Are You Providing A Truly Mobile Voting Experience? Nearly 60 percent of American adults use a smart phone and more than 40 percent use a tablet device. More than 60 percent of adults with cell phones use their phones to go online and, for more than half of them (34 percent), their phone is the primary device they use to go online (Pew Research Internet Project). If your organization has a website, it’s more than likely viewable by anyone using a mobile device. But viewable is not the same as offering a truly optimized experience. What does this mean for your election? If you are offering your members an online election as a quick and easy way to vote and your site is not optimized for mobile viewing, you are offering your members problems and frustration. 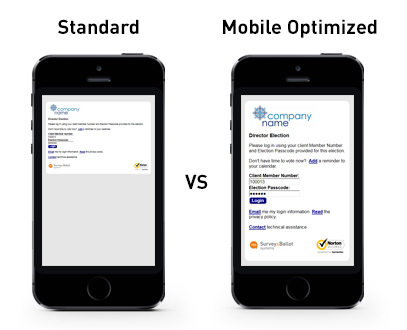 What does a mobile optimized site offer that a non-optimized site does not? Code that automatically detects device type and displays the appropriate web page and size for viewers. Since 1990, Survey and Ballot Systems has set the standard in innovative election technology for member organizations. We came of age with the Internet and we understand and advocate evolving with the technology. That’s why we’re pleased to be able to offer DirectVote®7.7 with an optimized web experience so your members can access their online ballot from any device – computer or mobile. Quick test: Use a smart phone or tablet to access your organization’s online voting site. Can you view it properly or are you zooming, scrolling, squinting and getting frustrated? If it’s the latter, we should talk before your next election!